Toyota Vigo Thailand remains Sam Motors Thailand largest selling pickup since its inception in late 2004, its demand remains undiminished. Toyota 4x4 remain our best selling vehicle, our Dubai division Sam Motors Dubai cannot keep up with its demand for Toyota Hilux Surf, Toyota Landcruiser Prado and the higher end Toyota Landcruiser. Even before the release of Toyota Vigo Thailand, Toyota Hilux Tiger was our best seller and we still continue to export hundreds of Toyota Hilux Tiger along with nearly new and second-hand Toyota Vigo Thailand. Used Toyota Vigo is now selling just as briskly as the brand new zero meter Toyota Vigo Thailand. There is no better workhorse than Toyota Hilux whether in a farm or mine with the comfort of a luxury sedan. Single Cab Toyota Vigo Thailand is only available in 4x2 but Extra Cab Toyota Vigo Thailand and Double Cab Toyota Vigo Thailand is available in both 4x2 and 4x4 configurations. For more details on Toyota Vigo Thailand please visit our detailed Vigo page at http://www.sam4x4.com/vigo.html. Toyota 4x4s as Toyota Vigo Thailand, Toyota Hilux Surf, Toyota Fortuner, Toyota Prado and Toyota Landcruiser are loved and admired the world over for their distinctive look, best quality, reliability and comfort. Toyota Hilux became popular right after its release some five decades ago an continues its popularity with the advent of Toyota Vigo Thailand. It has latest 4x4 technology that make it an offroader dream vehicle while building on its reliability, performance, comfort. Email us now at thai4x4@gmail.com to acquire your very own Toyota Vigo Thailand or used Toyota Hilux Tiger or email thai4x4@gmail.com to acquire Right Hand Drive or Left Hand Drive Toyota Hilux Surf, Toyota Prado, Toyota RAV4 or Toyota Landcruiser or any Toyota of your dream. Here is a living testament to toughness and durability of Toyota Hilux. 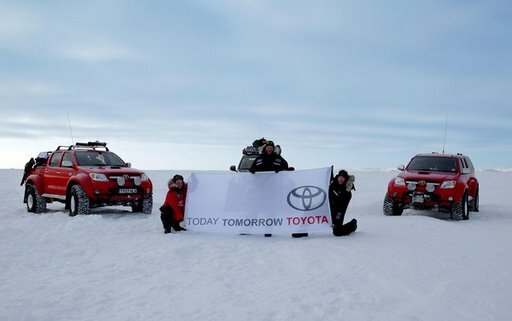 Toyota Hilux Vigo is the first vehicle to make it all the way to the North Pole. If it can survive the harsh driving conditions of the Pole, imagine how its sturdiness can help you in your off-road and on-road chores in and around the city and town. No surprise Thailand-made Toyota Hilux Vigo remains a best favorite of not just 4x4 enthusiasts but also farmers, factory owners, miners, militaries, aid organizations working in difficult terrains and almost everyone else. It is therefore no surprise that Vigo remains the largest selling 4x4 pickup at world's largest exporter of diesel 4x4 vehicles - Sam Motors Thailand. For more details on Toyota ilux Vigo please check our page on Vigo. It has detailed specs of single cab Hilux Vigo, extra cab Hilux Vigo as well as double cab Hilux Vigo.